About the time I hit 5th gear, all hell broke loose. A class 5 (unlimited Baja Bug) appeared coming head on, he and I traveling 50-60 mph. He was 50 feet from me. The overhanging Mesquite trees made it impossible to see him coming around a turn. All I had time to do was jump straight up and hope my feet would clear the bars. The jump and flight was awesome. I saw the exhaust stinger go right under me. At that moment I recall the sound of my 250R grenading into say, 8 or 10 manageable pieces. Feeling good that I avoided body vs. car contact, I neglected to prepare for the inevitable contact with Mother Earth. It was the only time I lawn darted head first. I couldn’t get my shoulder tucked under to roll. I skidded and bounced headfirst from 50 mph to a stop. After I stopped I felt fortunate to be conscious. One problem though-I was blind, just darkness. I crawled off the trail into brush. Now the reality of being blind set in. “Oh no, my parents will be crushed.” My throat started hurting so I decided to get my helmet off. I started looking for the buckle. It wasn’t under my chin. Wtf? I found it under my left ear. I undid it and realized my visor was sticking out behind my left ear.My damn helmet had spun almost half way around. So I torque my helmet back around. I wasn’t blind anymore. Right on. I was looking into the back of my helmet. As my goggles came over my eyes, it was such an awesome feeling to see. Blood exploded into my goggles. I thought, “Okay, this doesn’t seem to be your average bleeder. This is a buttload of blood.” I could hear voices. It was the guys in the car, coming to my aid. They got to me as I removed my helmet. The look on one of the guys’ faces was priceless. He’d never seen a guy who had his face dunked in ketchup before; he almost passed out. Luckily the other guy ripped his dirty shirt off and stuffed it onto my face. He didn’t know where the blood was coming from so he pressed it on my entire face. After a few seconds he lifted the shirt and could see the split from the bridge of my nose halfway around my right eye. When the helmet spun on my head, the bone of my eye socket punched through the skin. My right shoulder ached but didn’t seem broken. All in all a successful wipeout, considering a head on with a car, with a closing rate of 100 mph. I asked the guys why they were going backwards on the course. They informed me that I was the one going backwards. What I didn’t know was that the start and finish of the loop was only 400 feet apart, separated only by a hedgerow of desert brush. After 2 or 3 minutes, I got to my feet. The two guys in the car and I walked back to the impact sight. Holy crap, there were parts spread everywhere. The car had a broken spindle and bent trailing arms. I guess my front tire slid by his right front. His right front shaved everything off the right side of the trike: brake pedal, peg, then axle. It ripped the axle out of the swing arm and ripped the swing arm loose of the frame. Something we never figured out was how it flipped up and hit the passenger side A-post on the car. Bent it in 8”. The co-driver thought I was dead. He thought I had hit the A-post with my body. He probably closed his eyes on impact. I told them my right shoulder was sore. They x-rayed me head to toe. After the doctor reviewed the x-rays, he determined my left shoulder needed attention…but it was the right one that hurt. Old injury I guess; I had neither worked on. I got my face stitched up. John hauled me back to camp. In the meantime, my brother had gone out and picked up all the pieces of my pre-runner (and Scott). When they rolled up, John asked Tom where the bike was. He said its back there, not visible over the side rails of the truck bed. John stuck his head over the side. There she lay. The only thing usable was forks, front tire and wheel, and the motor, which had to be gone through due to induced seizure. Can’t recall if it was broken or not. Now 12 hours before the race, a decision had to be made. I had asked the doctor if riding the next day would make the stitches bleed. He didn’t think so, but recommended I not ride, of course. I told John & Al I was good to race. They asked Dean Sundahl if he would fill in if I couldn’t ride. He agreed. He was going to solo on a Kawi. The next morning I awoke to a right eye swollen shut-just a sliver of light getting in. Sundahl was in, and I would watch. The race had Allen and Marty Hart even at 100 miles. But Marty in the move from CA to AZ, we had 1 hour or so to get from the end of the CA loop to the start of the AZ loop. Marty missed his start time due to yakking up breakfast . The race finished with Fox & Sundahl overalling. But Honda attempted an underhanded deal to give Marty the 3 minutes he missed at the start line. They were unsuccessful,due to John Tomson not letting Wes Mccoy pull a fast one on SCORE. All in all it was a good race. Our team won the thing, I was alive, I could see, and there was only one destroyed pre-runner,and a hefty hospital bill. Curiosity damn near killed this cat. Wow that is an unbelievable story and the pictures show how devastating the impact was! That is crazy! I was wondering what the red ring on the front wheel in the lower picture is? 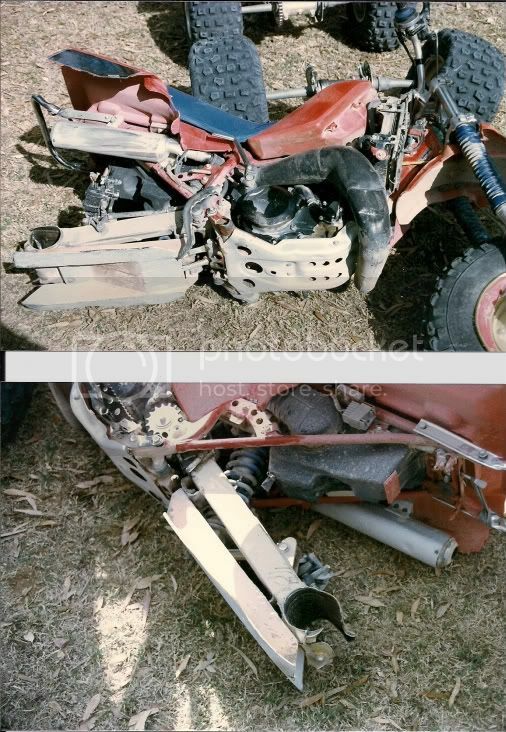 I went thru all the photos of that machine,I believe the red ring is duct tape,before a race we would mark parts that needed to be removed off our prerunners for race spares. Good eye it does look like a plastic ring in the pic. wow! serious inpact! Good thing your Okay. Thanx a million for sharing !! I had missed this till now.. Amazing story...What goes on in the desert ,,sometimes stays in the desert...Glad You made it out!